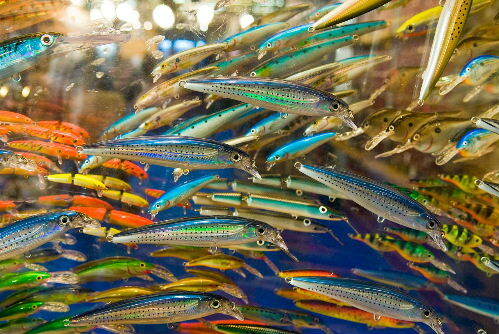 It's staggering that there are literally millions of freshwater fishing lures available on the market to choose from. There are a ton of quality name brand fishing tackle manufacturers that produce a wide variety of different kinds of fishing lures. And there's always something new and seemingly better coming out all the time. Therefore, it can seem a little bit overwhelming at times when shopping around and selecting the most appropriate lures. So, where does a fisherman begin? What lures should we risk buying to get the best bang for our buck, that are guaranteed to catch fish? Here's a well known interesting fact: About 90% of all fishing tackle is mostly meant to attract fishermen, rather than fish. Sure, most tackle can help you catch fish, but most often, if it doesn't appeal to the angler then it usually won't sell. This should be something to consider the next time you're out shopping... don't let yourself get pulled in by those shinny new fishing toys. Which name brand company produces the best lures for freshwater fishing? That is a great question. Each company designs and creates their own types of lures. All are mostly variations extended from old time classics. Some cater to just one style or a specific fishing technique. Others try to cover as many tactics as possible. The following is a list of some excellent major brands that produce some great fishing lures. I've bought tackle from about 95% of these guys at one point or another. Shop the Top Brands for Fishing Lures HERE. To help you with choosing which fishing lures to shop for, purchase, and to use, I've narrowed it down to a few segments that target the specific species of freshwater fish that you will be fishing for. This will definitely help you with selecting the right lure for the right fish. The following links will take you to specialized articles with helpful guides and recommendations of which lures are proven to produce fish. Depending on the elements and conditions, as well as what tactics you'll want and/or need to employ, these tips will help you decipher which will be the best bass fishing lures to cast out there. But first, I'm certain that you'll want to know which are bass fishing's best lures and where and why they rank in our top five selective categories. Opposed to largemouth bass, it's necessary to scale down on your tackle to accommodate these small-jawed, feisty-fighting bronzebacks. Find out what our picks are of the top five most productive smallmouth bass fishing lures. As with all species of fish, to have the best success at catching fish, it's best to understand what they feed on. Stripers are no exception. Find out about all the types of food and bait that they devour... What do striped bass eat? All panfish require implementing light tackle. This includes small crappie fishing lures like mini crankbaits for crappie. There are even more specialty kinds of lures like the Crappie Magnet, as well as the Wally Marshall signature series of Mr. Crappie baits. Have you ever caught any catfish on a lure, accidentally or intentionally? It's quite rare to hear of fishermen using artificial lures to fish for whiskerfish. Get some interesting fun facts about the variety of lures that different types of catfish have been known to lock their jaws onto, as well as resources of where to get your own catfish lures. Please Note: We will be adding more top recommendations of high quality freshwater fishing lures as time permits, and as they are proven to be a hot product for must-have weapons in your arsenal. In the meantime, please feel free to have a look around through our recommended online freshwater fishing tackle resources to find your favorite fishing lures. Begin shopping the top brands of fishing lures here.